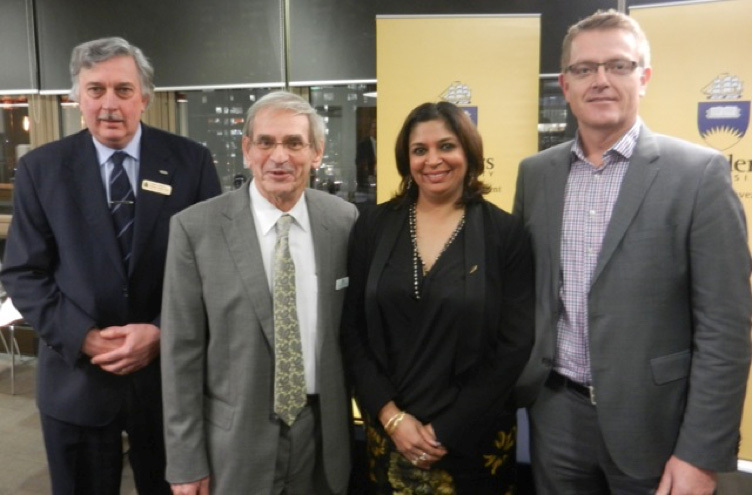 The Australian-American Fulbright Commission announced a new Distinguished Chair in Applied Public Policy to be Sponsored by Flinders University and Carnegie Mellon University Australia, at a ceremony on Thursday June 18, 2015 in Adelaide. The new partnership will bring one U.S. Distinguished Professor in the field of Applied Public Policy to Australian shores each year for the next five years, for a four-to-five-month program of collaborative research and knowledge-sharing. The position aims to increase the awareness of the study of applied public policy in Australia, and to foster and promote comparative and collaborative research between Australian and U.S. experts. At Flinders University, the distinguished chair will be affiliated with a School or Centre matching his or her disciplinary expertise; visit faculties, schools, research centres and institutes; and is also encouraged to associate with the Flinders American Studies Program. At Carnegie Mellon University Australia, the Distinguished Chair will be affiliated with the Public Policy & Management Program and the Information Technology Program, give guest lectures in both programs, and teach a mini-course on applied public policy.